Key to Helen's working process is her collaborative nature. Her work is not insular, rather, she provides points of entry, rendering her creative efforts accesible and open. This extends outwith projects featuring her own works. Helen curates exhibitions, chiefly through her role as Director and Co-Founder of Tatha Gallery. The two practices work successfully in tandem. It allows her to constantly question her own practice and move her own work on and forward and is always inspired by others. Through Tatha she wishes to facilitate, celebrate and show the debth, breadth and quality of Art that Scotland has to offer in a sympathetic and accessible way. "We will change your life through art." 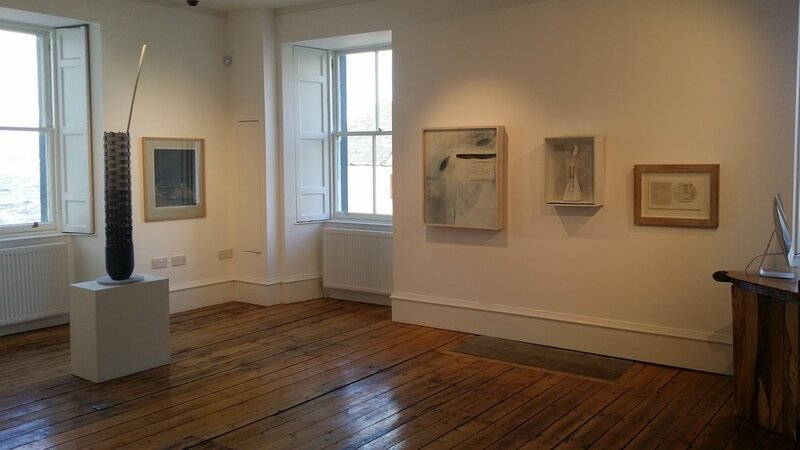 Co-Founded by Helen, the Tatha Gallery in Newport on Tay, Fife, Scotland specialises in art that we (the founders) are passionate about which includes some of the best Twentieth Century and Contemporary British Art. Emerging talent mixed with the time honoured established artists makes a recipe for interest, excitement and excellence. We have the refreshingly simple ethos of making art accessible. We aim to reflect our enthusiasm and love for Fine Art and to convey and share our dream so that others may also experience it. We believe that art is powerful, given the chance, it can exert major benefits on peoples lives. We hope that you will discover that the Tatha Gallery is a welcoming, fun and un-intimidating space in which to spend time with families and friends. Whether you spend two or two hundred minutes in the gallery we hope you will enjoy it. Feel free to breeze through or loiter with us for as long as you want. With this in mind all shows are guaranteed to be lively and thought provoking a great environment to find something you love with a passion. Coming from a family of artists and art collectors, Helen is drawn back to art repeatedly even in the midst of her own studies she seeks the solace of her peers work. Her studio is as much library as a space for her easel. Reference books of artists are thumbed and devoured intermittently like some ever-hungry herbivore. Her areas of interest come naturally to her as if she knows instinctively the work in front of her. She seeks quality in her selections and it is this that acts as her guiding principle. Able to appreciate many different genres of work she has the uncanny ability of being able to free the paint from any canvas and immerse her companions in the work. Her long -term interest in the variety of art leaves her with a wealth of understanding about a diverse number of artists from the relatively unknown to the masters. Her love for art is infectious when she leads you into any canvas. The view from Tatha Gallery, over the Tay River.